Pavers refer to blocks or slabs which can be used to cover the accessible outdoor surface in your property. Some of them are made from natural rocks like limestone or sandstone, while some others are the products of chemical or recycling process. Because they come in a wide range of color, size, and style, pavers are a great way to beautifully landscape your walkway or driveway, as well as the patio or pool deck. There are different types of pavers available in the market. Some popular paving materials are listed as follows. Bluestone is often used to create an elegant look in the pathway. This popular variety of sandstones is durable and flexible to use. You can cut the material into different tiles and patterns, crush it into gravel, or leave it in slabs. Besides several benefits above, bluestone also comes in beautiful color shades. As the name suggests, the initial color of this material is royal or bright blue. However, when it is exposed under the sunlight for a long time, the color will start to fade and turn into light gray. 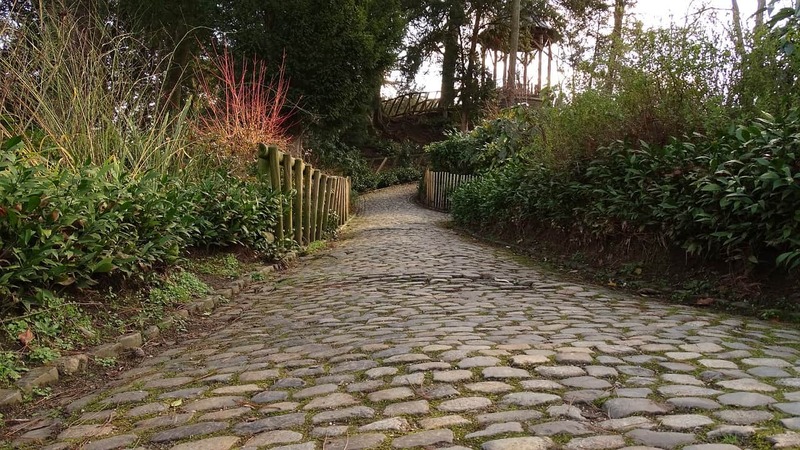 Clay or brick pavers have been used as the material to build a pathway for centuries. They come in various shapes and colors so that you can form a path with an aesthetic pattern using this material. Moreover, because bricks are made of natural sources, they are eco-friendly and easy to cleaned or reused. In spite of it, bricks are considered more fragile than any other types of pavers. A good pathway base and frequent maintenance are required to prevent brick pavers from cracking after they are used for a long period. Cobblestone is included on the list of best pavers due to its durability and aesthetic feature. This material commonly comes from several types of natural rocks, such as basalt, granite, sandstone, or limestone. In line with its high quality, cobblestone is usually sold at a higher price compared to other types of pavers. With proper installation, cobblestone will last for a long time as your driveway or walkway pavers. Also, its maintenance does not require much effort because you only need to wash it once or twice a year. If you are planning to build pavers for driveway, concrete should be on your top list. This material has a perfect thickness and texture to cover the road that leads to your home. Besides, it presents a natural look and can be applied to the driveway with a minimalist concept. Another advantage of using concrete for the driveway is its simple installation. It is easy to cut and place concrete on the pathway of your drive. However, to prolong its life and durability, this material needs high maintenance. Of all paver types that are available in the housing market, fieldstone is a paving material that wins at look and strength. It is one of the most natural stone pavers with a high density. Because of this, fieldstone can be used for different purposes of landscaping, from the patio to driveway. Fieldstone with softer and thinner features is also suitable for outdoor flooring decoration. Coming from sedimentary rock, flagstones are usually chosen as the main material for patio paving blocks. They are not a good choice for driveway because of its thin features. Nevertheless, flagstones have a unique shape and can be perfectly fit onto the path like a puzzle. The common colors of flagstone are gray and red, but there are some other colors available if you want to make a special pattern in the pathway. Formed by exposing limestone to extreme heat and high pressure, marble is not only good for indoor flooring. You can also use this material for patio, driveway, or walkway pavers. It creates an elegant look while showing a smooth and attractive shape on your pathway. Despite its attractive features, marble can easily conduct heat when it is exposed under the sunlight for a long time. Also, its smooth color might fade because of stain or cleaning products. Plastic paver is the product of recycling plastic wastes. The wastes are melted with water and then mixed with soil in paver-shaped containers. This process is an innovative way to reduce the abundance waste of plastics. Although it is beneficial for the environment, pavers made out of plastic wastes are usually more expensive than regular materials. Nevertheless, you are still able to create a beautiful walkway or driveway using plastic pavers because they come in various styles and shapes. Similar to bricks, porcelain pavers are based on clay material. Porcelain in particular exhibits natural beauty that makes it looks appealing when being applied to the pathway. Besides, this material does not need a lot of maintenance and relatively cost less than marbles and cobblestones. However, porcelain is not recommended for pavers if you live in a highly elevated area. Heavy frost or extremely cold weather will influence porcelain’s durability, causing it to break more easily. As an alternative material, rubber is more practical than other types of pavers made of natural stones. You can also buy this material at a lower price because it is mostly produced from recycled materials. Another significant advantage of rubber pavers is its safety features. Rubber is shock-absorbent as well as slip-resistant. For this reason, you don’t need to worry about getting slipped when walking along this paving material, even when the path is wet. Travertine is developed from sedimentary rocks that have been exposed under pressure with changing temperature. Because of its natural quality, this material becomes a popular choice for outdoor landscaping such as patio and pool areas. It is also available in various color tones so that you can form it into different paver shapes. In addition to the outdoor use, travertine is good for countertops and some other settings of indoor flooring. Knowing several types of pavers will help you decide the most suitable type to pave your own backyard, patio, walkway, or driveway. Since pathway with a good base and attractive feature will add more value to your property, it is important to choose the best paving material that has high durability and aesthetic design.